At the beginning of the 1930s J.F. van Royen, head of the Dutch postal service’s Department of Art and Design, approached Brinkman & Van der Vlugt about designing a public call box. Its design had to have something typically Dutch about it. The result was a transparent pillar of steel and glass with the telephone itself hung on two vertical steel posts. 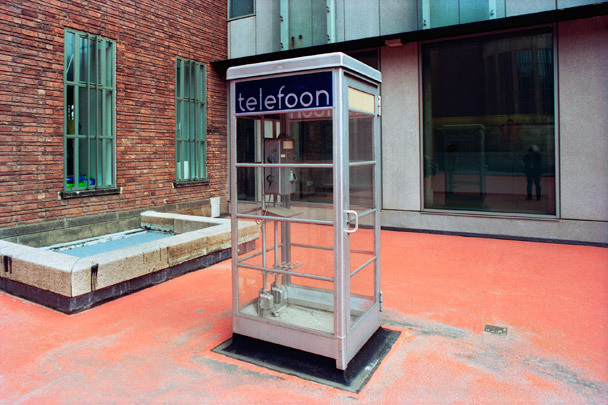 Produced by the firm of Gispen, the call box has the word ‘telefoon’ emblazoned on it in san-serif type. During its 50-year stint, 7500 examples of this call box were in operation all over the Netherlands. Since 1984 it has been superseded by the new kiosks. Other original call boxes stand at the Rijksmuseum in Amsterdam, at the Buitenhof in The Hague, on the Westfriesedijk in Warmenhuizen, in the Maankwartier in Heerlen, in the Spoorwegmuseum in Utrecht and inside the Albeda College at Zuster Hennekeplein 80.